We’re closing windows, pulling on sox and turning on the oven. Butternut squash are the ticket, at their best now, available in farmers markets and supermarkets. This is the time to buy them and to feast on their goodness (and their important vitamin A, the eye vitamin). We’re all familiar with baked squash dusted with cinnamon, dotted with butter and sprinkled with brown sugar. Good as it is, it can be a too sweet, when we’re looking for a savory lift that makes vegetables more interesting. I’m ready to combine the sliced neck of the squash with some ripe late summer tomatoes for a long bake in a shallow oven dish for a melt-together Mediterranean tian. A stuffed mini-pumpkin uses the bulb section of a butternut squash lightly filled with sharp cheese, onions, pepper and breadcrumbs to create a creamy, zippy filling that works magic with the bland slightly sweet squash. Both the stuffed squash and the tian can go in the oven at the same time or separately. Consider baking a squash dish alongside whatever else you have in the oven. Let’s make the most of that energy we have on the go and fill the oven. Even if it’s early in the day and you’re baking bread or a pie, slip in a squash dish, let it bake alongside and then finish cooking as the oven cools. The squash can be reheated for dinner or the next day quickly in a microwave, slowly in the oven or conveniently in segments in a heavy stovetop pot. 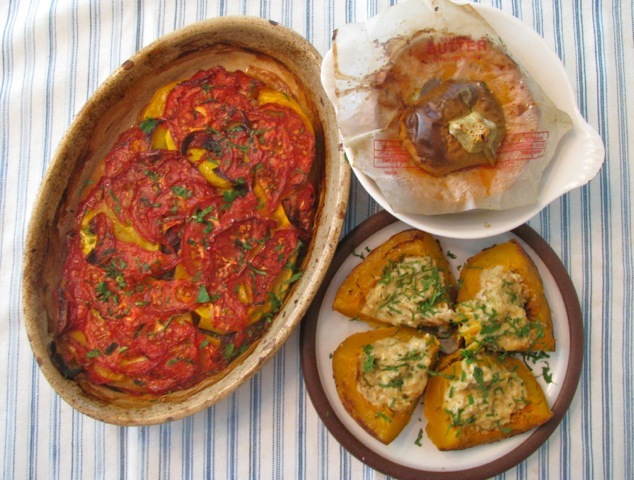 These squash dishes will keep for 5-6 days, taste even better when reheated and can perk up any simple midweek supper. The tian is good at room temp and makes a tasty to-go office lunch with a blob of Greek yogurt. For the best tasting butternut squash, choose squash no bigger than 2½ pounds. Recent experience has shown me that the best tasting, deepest colored squash comes from the smaller fruit. Gently sweat the onion in 1 tablespoon oil until softened and translucent. Film a 6-cup shallow baking dish with oil and layer in the vegetables, sprinkling each layer with a pinch of salt. Drizzle remaining olive oil over top, grind on fresh pepper and bake at any oven temperature you have going—350º to 450º for 45 minutes to an hour and a half or until the squash is tender and the top flecked with brown. Let dish rest in the oven until cooled for maximum concentration. Serves 4-6. Reserve the sliced off squash tops to use for lids. Cut the squash blub where it begins to bulge into a pumpkin shape. Scoop out the seeds. Sprinkle the squash interior with salt. Sweat the onion in olive oil or butter just until softened and translucent (cover with a butter wrapper to encourage even cooking). Mix together cooked onion, breadcrumbs, garlic, thyme, parsley, chili or pepper, cheese and little salt. Loosely fill the squash interiors with stuffing. Pour 2 tablespoons cream over stuffing in each squash. Top each squash with a paper butter wrapper (or square of foil) and weight it in place with the squash top (see photo). Place filled squash in baking dish and cook alongside whatever is going in the oven. Squash will bake at any temperature between 350º to 450º for 45 minutes to an hour and a half or until squash is tender. If squash are baked at a high temperature, it would be wise to add a little water to the bottom of the baking dish to encourage steam and to prevent burning edges. Baked squash may rest in the turned off oven to continue cooking. To serve, cut squash in half or quarters; the skin is edible too. Enough for 4 to 8. Somewhere back in the early years of prepared foods, someone set a precedent for clam chowder so thick it would mound in the spoon like soft mashed potatoes. This gluey, starch-stiffened version now fills the bill in many fish joints up and down the eastern seaboard. It’s heavy on calories and a far cry from the original fish chowders that were mainstays for early settlers. Fish chowders are meant to be soups, really soupy, the kind that will soak into crackers or toasted bread. They should be as nourishing as whole meals with vegetables, fish and broth simmered together in a heady steam redolent of pepper and thyme. A homemade, old-fashioned fish chowder will quickly transport you to the seaside. With today’s access to fresh fish, you can bring coastal breezes into your own kitchen any day. You don’t need more than onions, celery, potatoes and fish for good chowder, though the broth that brings it together helps a lot. A homemade fish stock is preferable, but your basic chicken stock will suffice. The next time you stand at a counter where whole fish have been filleted, you might ask for some bones on the side. Or the next time you steam a lobster or a Dungeness crab, break up their shells, add some water and simmer them for 15-20 minutes, then strain off the flavorful broth. On a recent visit to Cape Cod, after I had retrieved the broth from steamed clams and lobsters, I selected a hunk of local bluefish and returned to the cottage to cook up a delicious chowder. In a large soup pot, gently fry bacon until golden and rendered. Remove bacon to small dish and retain 3 tablespoons bacon fat in the pot. Add 1 tablespoon olive oil and sweat onions and celery until translucent. Add garlic, chili, thyme and sauté until fragrant. Add potatoes, stock, salt to taste. Cover and simmer until potatoes are tender. (At this point, if you prefer a thickened chowder, use a slotted spoon to remove some of the potato cubes on a plate and mash with a fork. 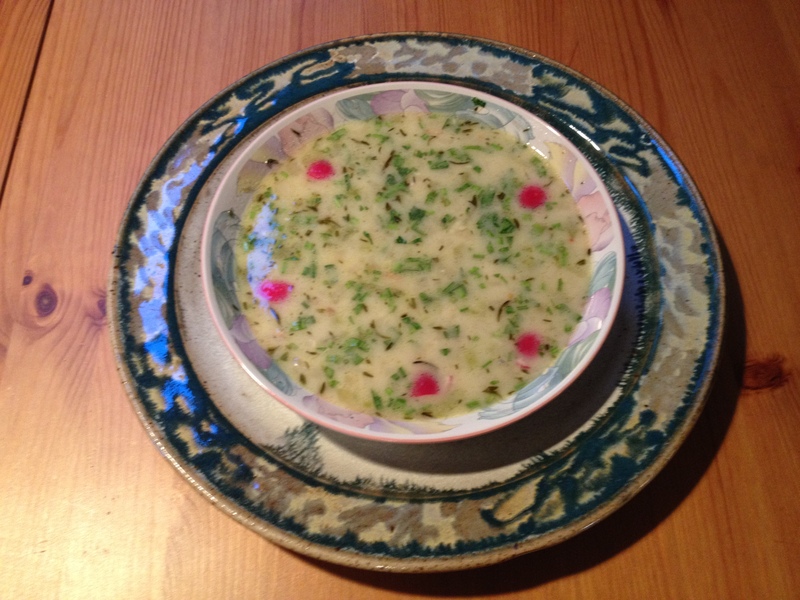 Scrape the mashed potato back into the soup and swirl to combine.) Add the cubed fish and simmer five more minutes or just until the fish is cooked through. Add cream, reserved bacon and correct seasonings with salt and pepper as needed. Garnish with chopped parsley, chives and radishes for a bit of color. Makes 8-10 first course servings or 4 main course portions. You are currently browsing the Mary Jo's Kitchen blog archives for September, 2012.